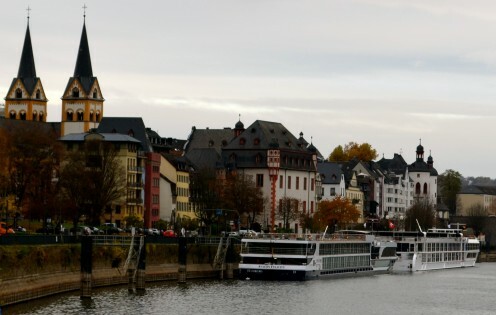 The Rhine and the Moselle Rivers meet at this 2000-year-old town, located at the northern end of the most scenic section of the Rhine. Our riverboat, the S.S. Antoinette, moored itself in a prime spot in old town, just behind the Avalon Felicity. From here it was the perfect spot to take a walking tour of town. Just adjacent to our ship was this colorful building. 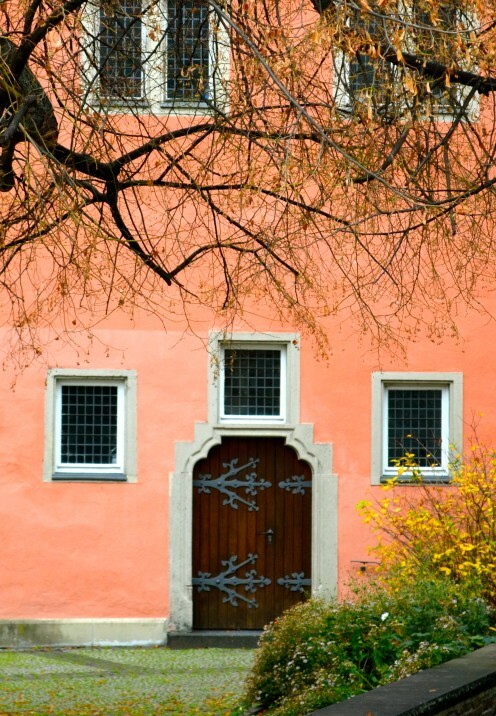 It is called Schöffenhaus, or “assessors house” and is now part of the Middle Rhine Museum. 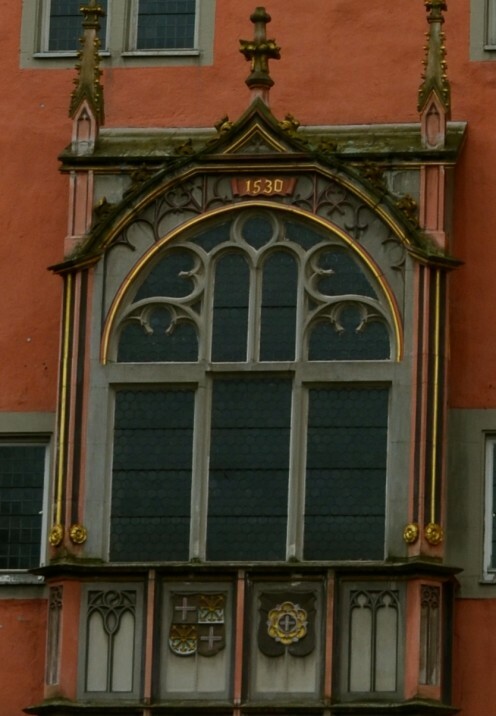 A marker above the ornate window dates the building back to 1530, making it 477 years old. That’s relatively young considering that the town itself is over 2,000 years old. 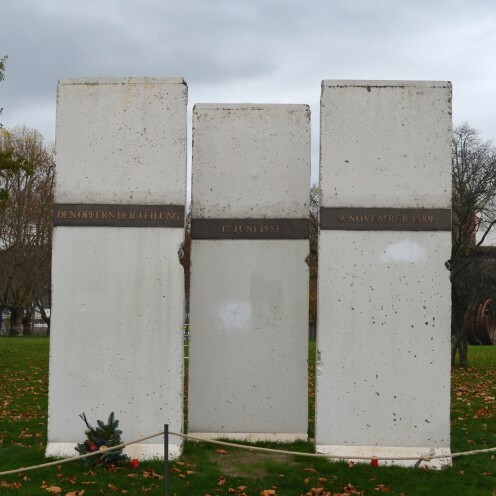 The promenade along the river takes one past an installation of 3 panels of the Berlin Wall, intended as a symbol of German unity. 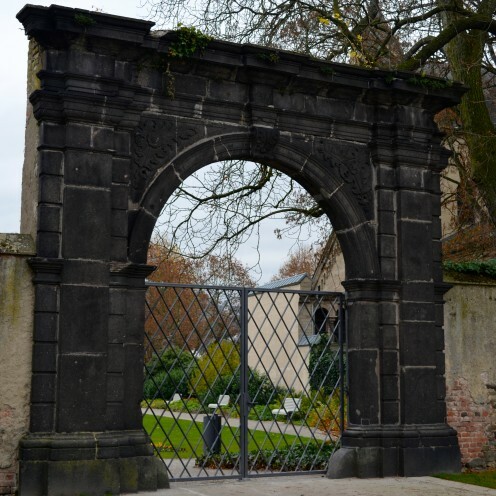 A portion of the old town still retains a fortification wall that once protected the city. 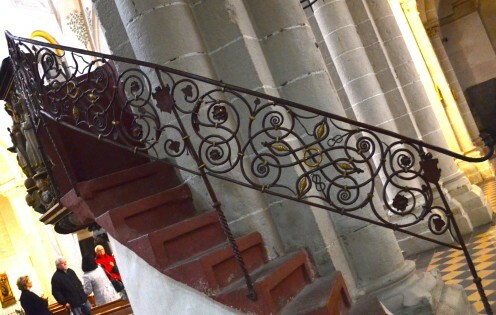 Since I’m in the hand forged wrought iron business I can’t resist taking photos of anything iron. 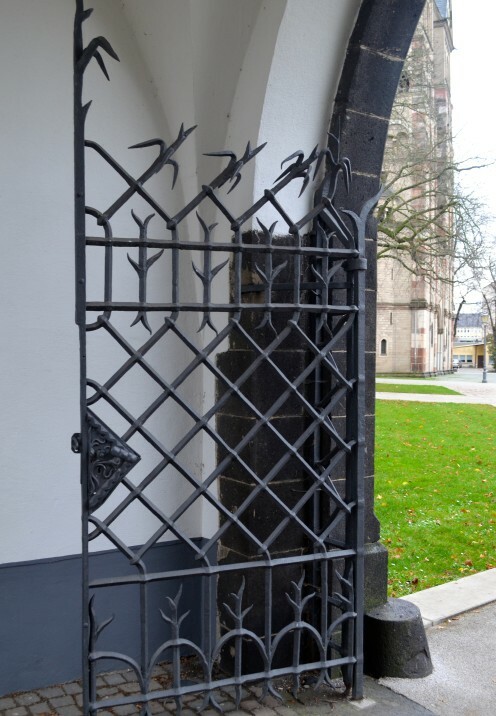 I think these gates are beautiful. Just past the wall we entered a courtyard containing this whimsical statue. 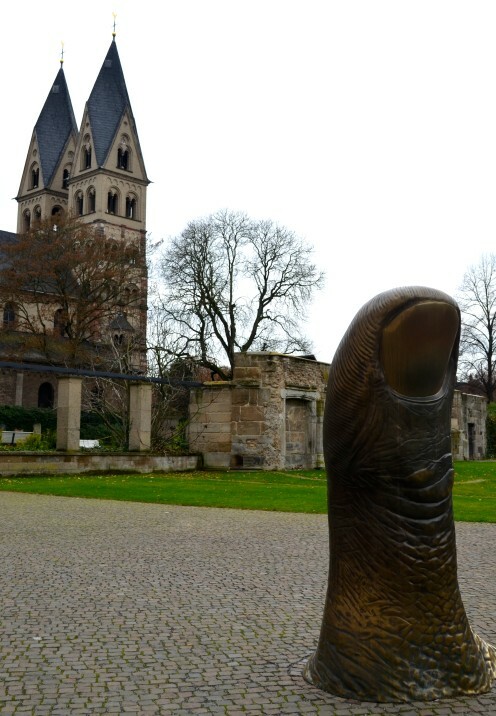 Later we’d find several other interesting statues in this city. 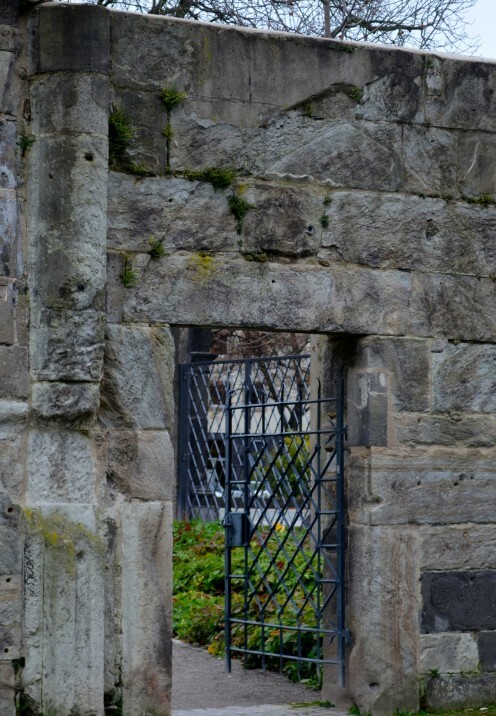 In the background is the Basilica of St. Castor. 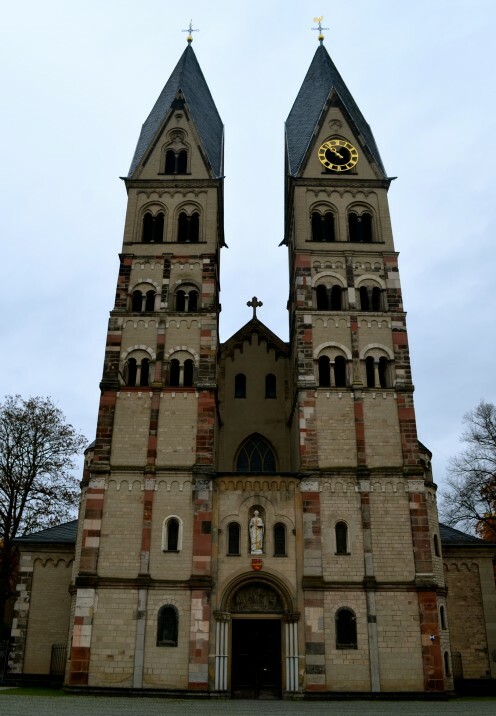 Founded in 836 AD, the Basilica of St. Castor (Basilika St. Kastor) is the oldest church in Koblenz and has been designated a UNESCO World Heritage site. 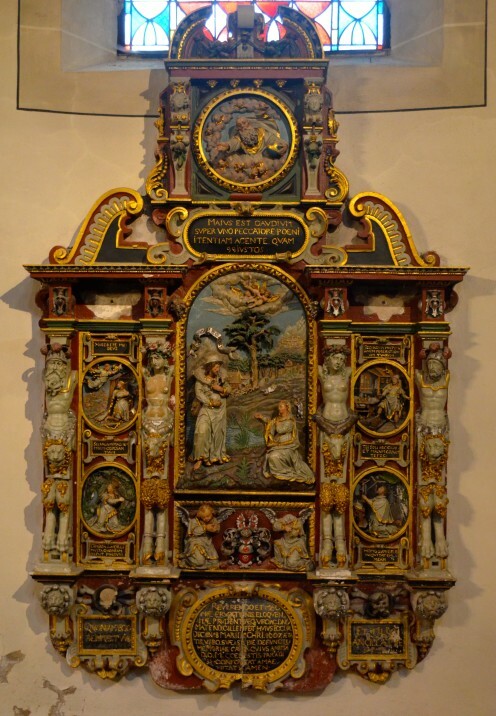 The church honors St. Castor, who is said to have worked as a missionary on the Moselle in the 4th century. 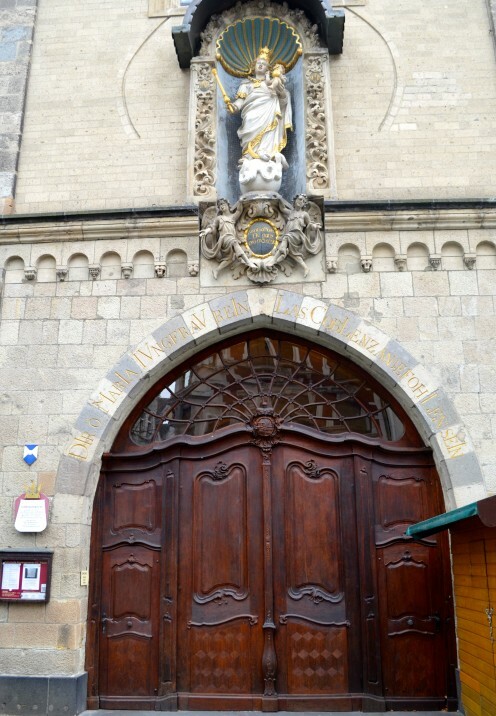 Just past these doors is a charmingly beautiful church. I would describe it as “restrained” in its embellishments. 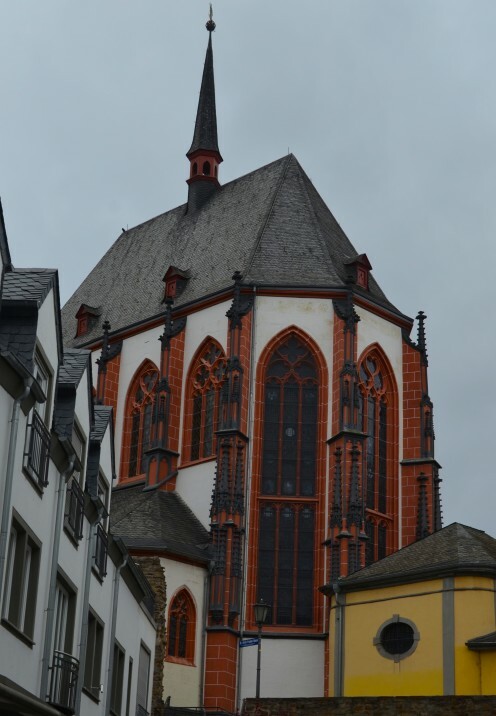 It’s subtly beautiful without being over-the-top ornate like the Cologne Cathedral I showed you in my last travel post. 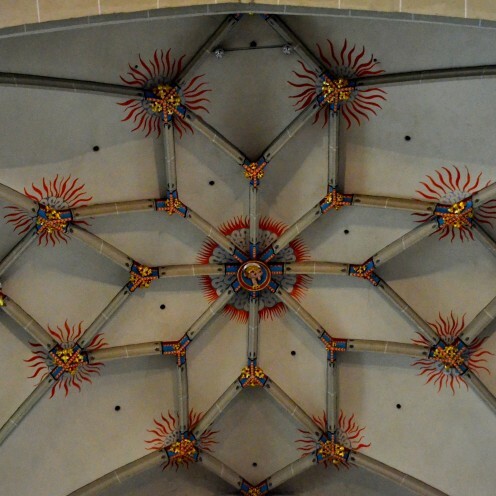 Such an interesting decoration in the vaulted ceiling. 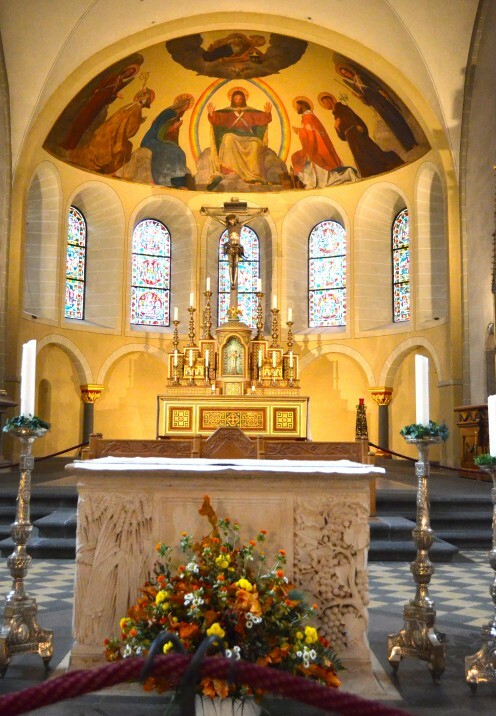 Notice how the warm colors used are carried throughout the Basilica, in everything from the stained glass windows, to the paintings on the walls, to the flowers on the alter. If I lived in this town I’m sure I’d attend this church, if for no other reason than the fact that the muted, soft & understated beauty of the place moved me. 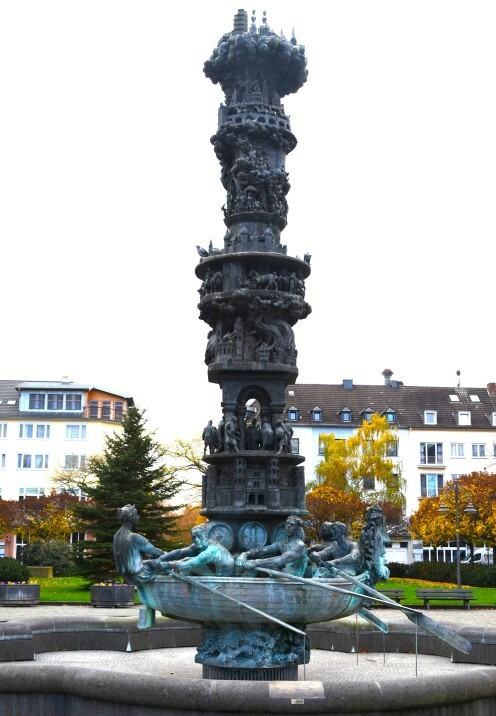 As we continued our walking tour of Koblenz, Germany we came upon this fountain known as the Koblenz History Column Fountain. 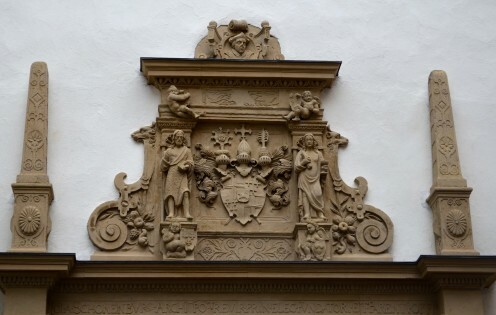 It depicts a ship carrying wine on the bottom and the history of the Roman settlement of Koblenz going up the intricately carved column. 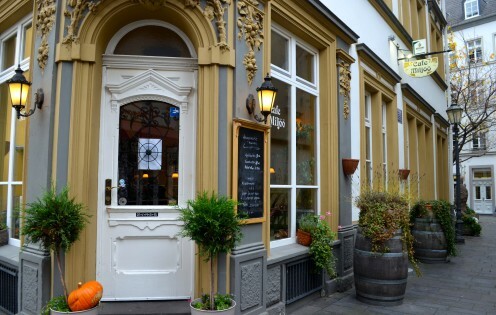 The historical centre of Koblenz is called the “Altstadt” or old town. 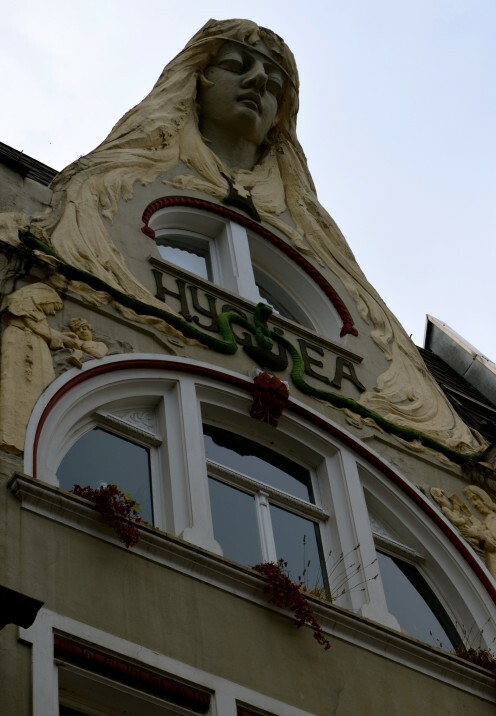 As we strolled through its small and narrow streets we came upon this unique building featuring Hygeia, the Greek Goddess of health and beauty. 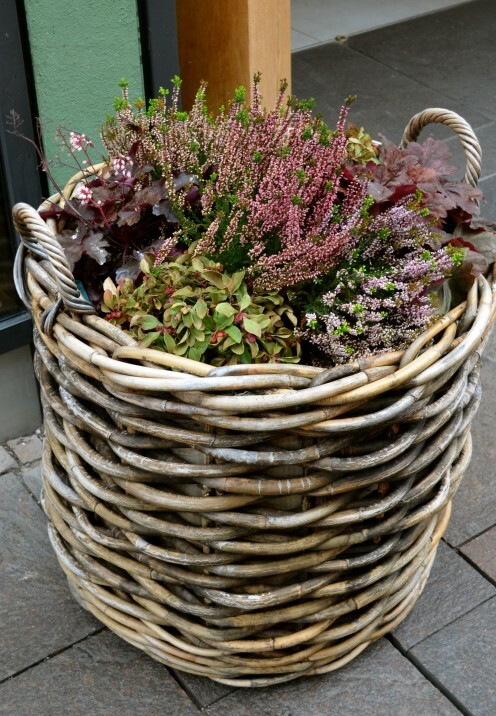 Although our visit was in winter, it was not uncommon to find baskets of flowers like this one decorating the streets. Such a nice touch! 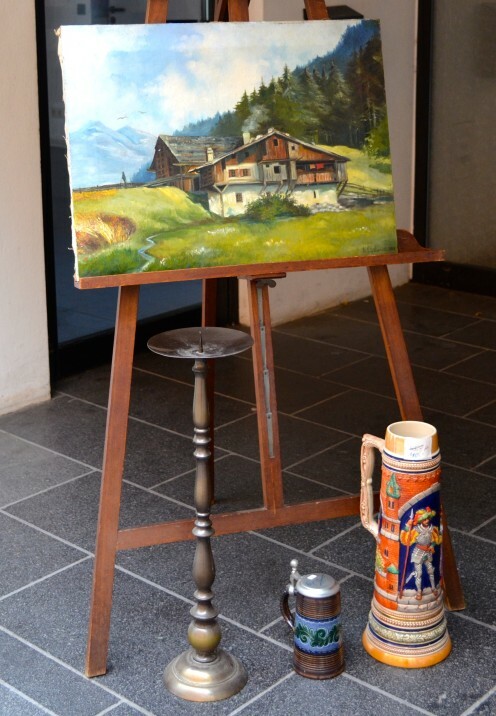 And an art gallery had this lovely vignette on display. 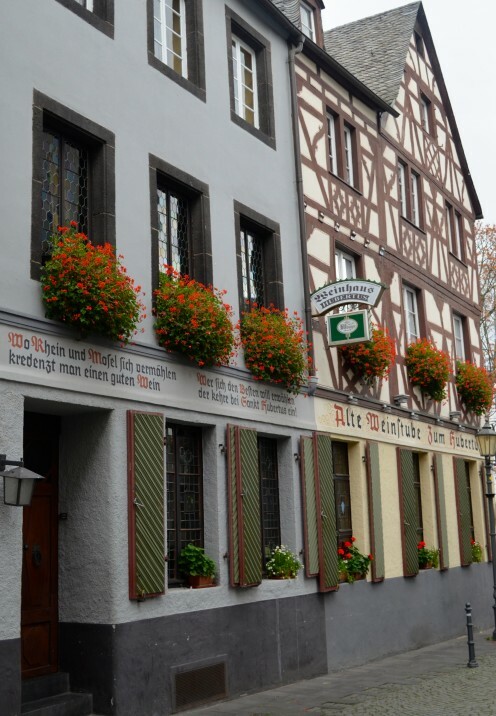 Koblenz has many pretty half-timbered structures like this one, also decorated with flowers in the dead of winter! and this one where we were tempted to come back for dinner. But alas, the delicious food on the S.S. Antoinette kept us from doing so. 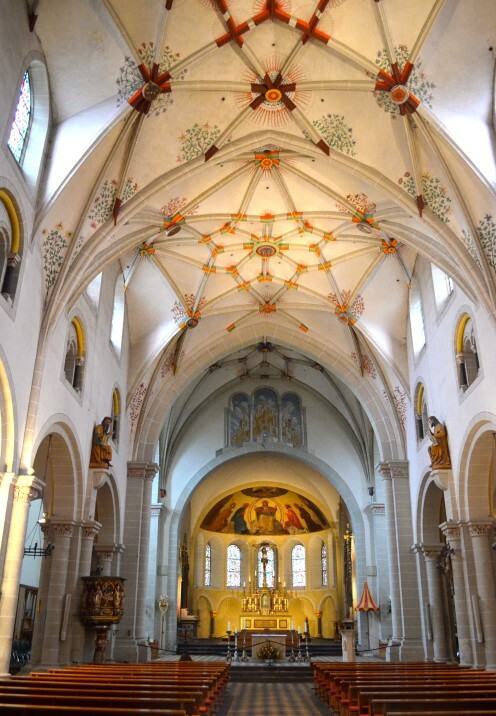 Continuing our walk, we arrived at the Romanesque Church of Our Lady, located on the highest point in Old Town. 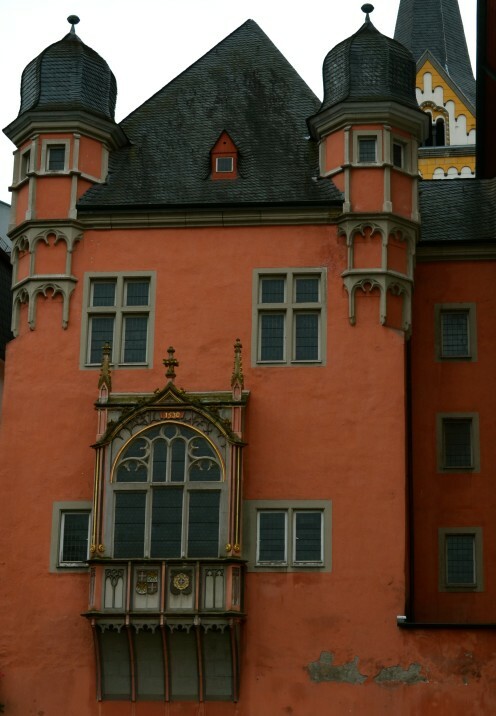 It is famous for tolling the “Reveler’s Bell” at 10:00pm each evening. 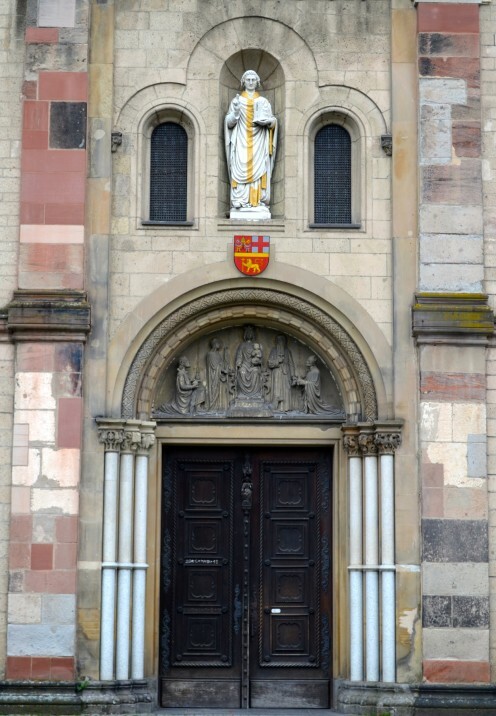 I admired her lovely wooden doorway and the statue of “Our Lady & Child” above it. The church was closed on the day of our visit so sadly we did not get to peek inside. We also strolled past this attractive building with a dozen dormer windows that are opened & decorated during the 12 days of Christmas. 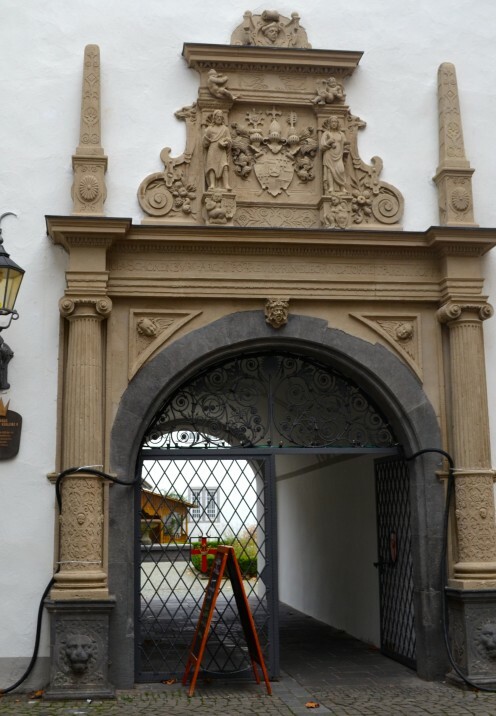 Each German town has it Rathaus or City Hall, and the entrance to Koblenz’s City Hall was ornate and beautiful. 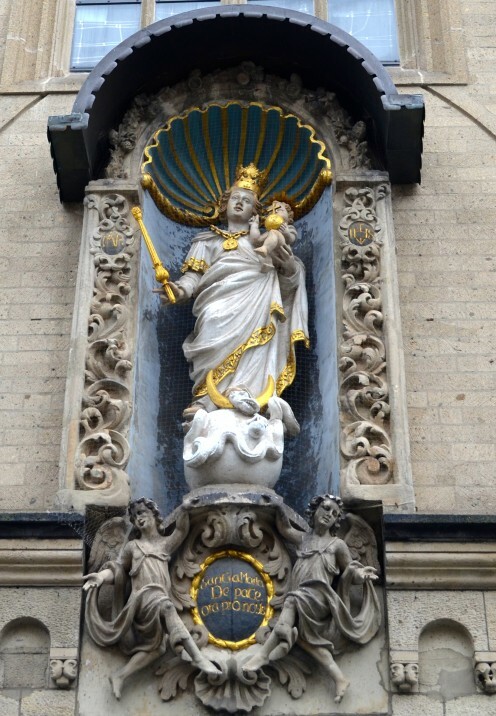 Also located in the town hall square was another whimsical fountain, this one dedicated to the youth of Koblenz. Called “Das Schängelchen” or the “Spitting Boy” Fountain, and that is exactly what he does at very unpredictable moments. If you wait long enough you may just get soaked by this petulant boy. 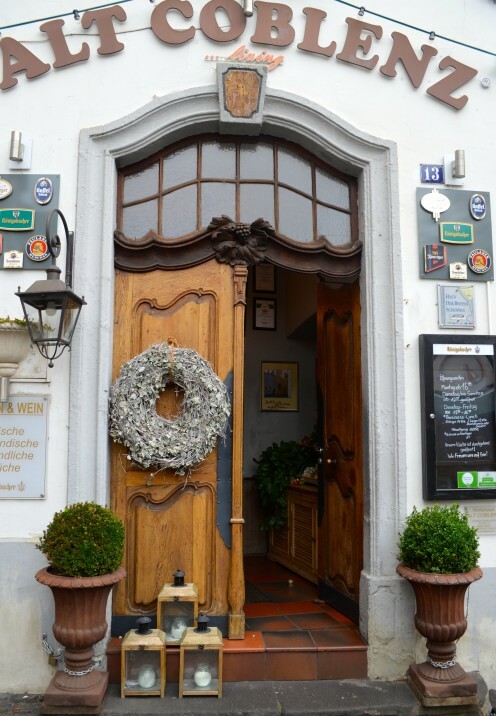 The last stop on walking tour of Koblenz was St. Florin’s Square where I photographed this attractive building with its interesting door. 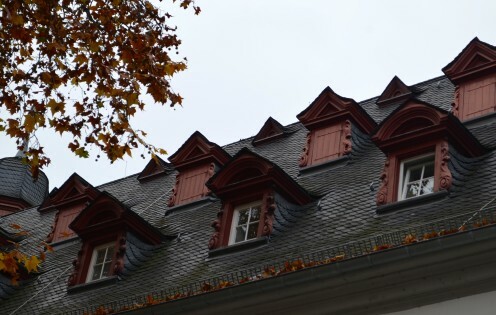 Next door was the Mittelrhein Museum. 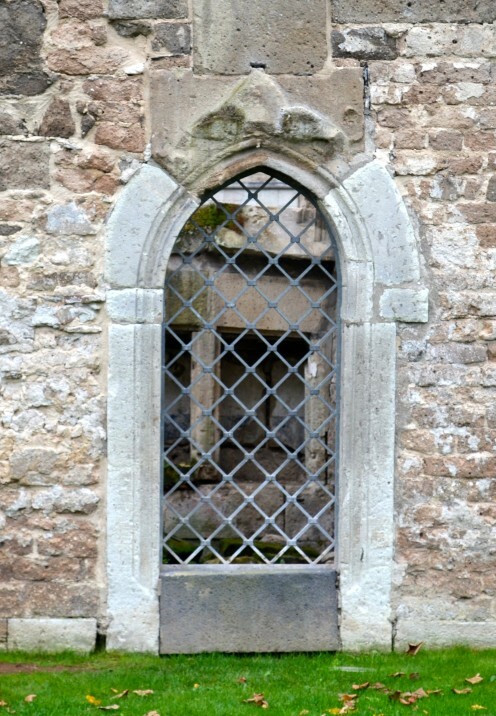 Its tower houses a clock with a relief of a man’s face below it. 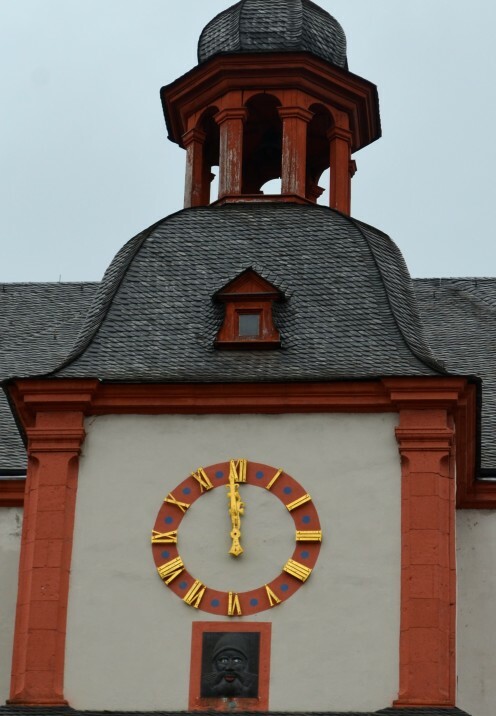 The eyes on the face move right and left in accordance with the clock. At hourly intervals he sticks out his red tongue. 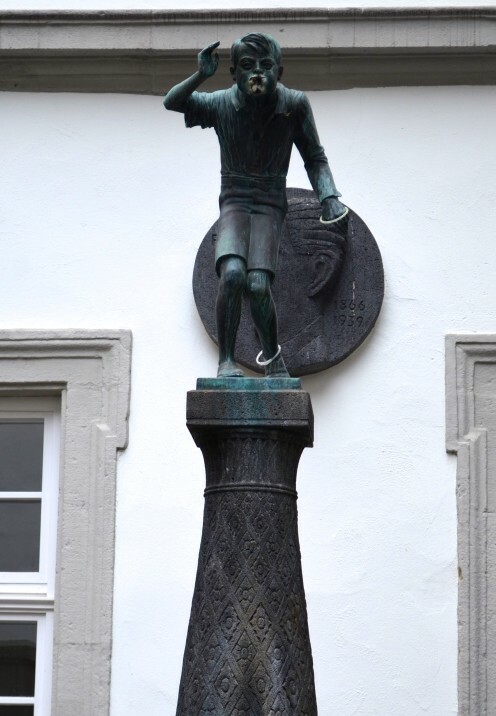 Legend has it that the eye rolling man depicts a 16th century robber baron called Johann Lutter von Kobern who was beheaded at the market square of Koblenz in 1536. He is said to have rolled his eyes and stuck out his tongue as he was hung. 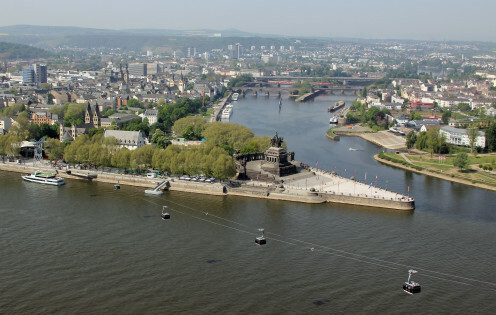 And on that lovely note I shall end this tour of Koblenz. Oh, and by the way, HAPPY LEAP DAY! !